If you are planning a flight to Malibu, give Charter Flight Group a call to arrange a private jet charter and avoid the crowds at airport terminals as well as long waits in security. With more than thirty years experience, Charter Flight Group can charter virtually any aircraft needed for your private flight to Malibu, California. Sunny beaches await you in Malibu, but getting there is far more relaxing and pleasurable on any one of CFG’s fine, luxury jets or turboprop planes. If you need something light for a quick jump along the coast to Malibu just charter a Cheyenne turboprop airplane. If you prefer a jet, check out any of our enormous fleet of Cessna jets, Lear jets, or others. Maybe you need a private jet with greater range, then a mid-size jet such as an Astra jet or Gulfstream G150 jet would be a finer choice. Or perhaps you are planning a trip to Malibu from across the Pacific or East Coast. In this case, you may prefer a heavy jet or airliner such as an Embraer Legacy or Boeing 737 jumbo jet. Regardless of you needs in private charter flight, CFG can provide. Charter Flight Group has amassed such a fleet by being the most professional, safest, most service-driven private charter company in the business. To ensure safe aircraft, CFG retains the services of two of the most renowned flight safety groups in the world, Wyvern and ARGUS. To ensure safe and comfortable flights, CFG recruits only the best and most experienced pilots possible. Indeed, every pilot is carefully screened and any not meeting our stringent requirements must seek employment with others. Charter Flight Group has operators on stand-by 24/7 to ensure that you get service when you need it. With the most knowledgeable private air consultants, Charter Flight Group can help you select, not just the aircraft for you, but also the right kind of flight and airport in which to land. For instance, if you are in need of on-demand service, no problem. This is why CFG hires the best certified ground crews…to ensure that every private aircraft is in pristine condition and ready when you want. If you prefer a one-way or are maybe seeking an empty leg, just speak with your friendly charter flight consultant when you call. Of course, for your private flight to Malibu, you may choose from many airports including LAX, which requires but a nice drive north along coast on California Highway or perhaps you would like to land closer. Then why not have your private charter flight land at Santa Monica Municipal Airport. Or maybe you prefer exclusivity. Then Bob Hope, Van Nuys, or Whiteman Airports would be preferred. Regardless of your needs, your private jet flight consultant can make all your arrangements including ground travel to Malibu. On arriving in Malibu, there are plenty of things to do from nightlife to nature. 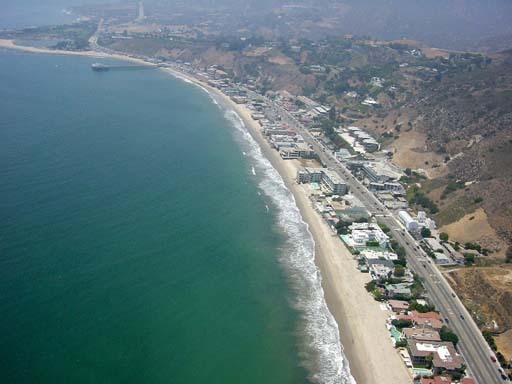 Of course, many go to Malibu for the waves, for Malibu offers some of the finest beaches and surfing in the world. Here are some of the more popular destinations in Malibu. If you like dinner theaters, imagine Magic and Wine Tasting with David Minkin; or perhaps you like art, then the Getty Villa will be more to your liking. 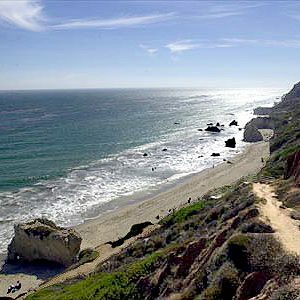 For surf and sand, El Matador beach is considered by some the best anywhere and of course, Malibu is home to Pepperdine University. There are scores of beaches from which to choose along Malibu’s “27 mile” (actually 21 since incorporation in 1991) shoreline, but one of the best places for enjoying the sun and sand takes place at Paradise Cover, where you can dine along the beach as well. For those taking a private jet to Malibu on business, naturally, the major industry here is tourism, so be prepared for numerous retail shops providing mainly, surf and sun-related items such as sunscreen, swimwear, and surfboards. Charter Flight Group provides only luxury aircraft so that regardless of your choice, you know your flight will occur in comfort and style. CFG hires only the most experienced pilots so that you know that your private jet flight will be smooth and relaxing. CFG places a premium on safe flights so that you can travel with peace-of-mind, knowing that you will arrive secure and on-schedule. Charter Flight Group uses only the most knowledgeable private charter consultants so that you know that nothing will be left to chance with your private jet flight to Malibu. Call now to book your private jet flight to Malibu…Consultants are standing by.